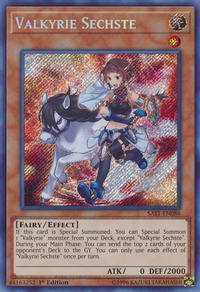 If this card is Special Summoned: You can Special Summon 1 “Valkyrie” monster from your Deck, except “Valkyrie Sechste”. During your Main Phase: You can send the top 2 cards of your opponent’s Deck to the GY. You can only use each effect of “Valkyrie Sechste” once per turn. Sechste is the German word for the sixth. This card’s youthful appearance and low ATK may suggest that she is the youngest member of the “Valkyrie” archetype, which would make her a Squire.